Jeng jeng jeng! I know there are many Revlon fans out there right? One of the best drugstore brand any makeup junkie can have! They product are very comparable to the high ends. As you all know that the famous Super Lustrous Lipstick from Revlon are already here in our participating pharmacies. Now they are adding more shade for you! 8 new shades for the Super Lustrous Lipstick and 8 new shades for the Super Lustrous Lipgloss! Here a big over dramatic selfie and pouty paper lips picture from me, Muah! During the event we have some little activities. We were taught on how to create 3D lips! It is very easy, the secret is using light shimmery shadow on the center of the lips! Gorgeous JQ Lee is our model of the day! Three winner have been picked and of of the is Sabby! The queen of lipsticks! Congratulations Sabby! Oh well, like the usual after makeup situation. Haha! Introducing the new additional shades of the Super Lustrous Lipstick! First impression of mine, at first I thought it was an opaque cream type of lipstick like we have in our drugstore. But this is a totally different formula! It is actually a sheer pigmentation but builable. But what surprise me that I kinda loving this formula! I don't really into sheer lipstick anymore because it tends to just give me a gloss color and feels sticky on my lips. This just amaze me and I could not imagine my self can wear plum lipstick! I totally loving the Plum Velour, luckily I got that shade in my goody bag! Yeah! I hope I can get more and do a review on it. What I can say about it is that it feels so light on the lips and more natural and if you don't like bold lips but wanna have that nice color on your lips, this is good to go! Another addition of the new shades are for the lipgloss! Actually there are 8 new shades, what I get to swatch here is only 6. Check out the digital graphic above for full new shades available. This one I think remains the same formula as the old ones, just a additional new shades to the collection. I love Snow Pink! This also feels so light on the lips! I love the small gold glitter in it! Also, another 2 new product coming your way! 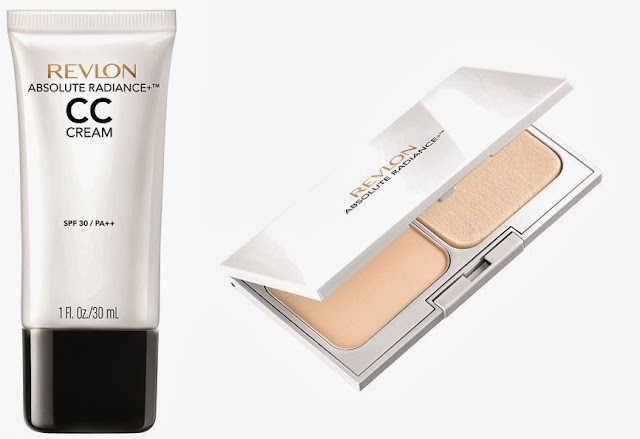 It is the Revlon Absolute Radiance CC Cream and Revlon Absolute 2 Way Foundation. The CC Cream comes in 3 shades to choose from and claims to be - One Step Complete Care Cream That Hydrates, Minimize Pores and Color Corrects in Just 7 Days. The 2 way foundation will comes in 4 new shades and claims to be - This new two-way powder whitening foundation is designed to even out skin tone, providing a new level of luminosity and a flawless complexion. Meet the ladies! I had so much fun! haha! best lipstick dia, smooth je bila apply. I love your post! <3 I had so much FUN time with you girlssss~ happy giler! Wow sab. You memang tak bagi i saving duit langsung. haha. I want it ALL!!! how did u get involved in their event? ?